Whole Ningaxia wolfberries and other nutrient – dense fruit juices make NingXia Red the perfect choice for optimising wellness and getting a new lease on life. NingXia Red health benefits include support from head to toe via a whole nutrient infusion. Here are 21 reasons to drink NingXia Red! 1. The Ningxia Wolfberry provides ample antioxidants to strengthen the immune system. Antioxidants permeate cell walls and attack free radicals before they damage the DNA of the cell nucleus. 2. Antioxidants of this berry fight arteriosclerosis and artherosclerosis – aiding the circulatory system – including the heart. 3. The Ningxia Wolfberry is powerful in helping the liver function properly. The liver is one of the most vital organs in the body – it’s our cleansing machine. 4. Helps the eyes, cataracts, glaucoma, and visual acuity. This berry contains a complete array of antioxidant carotenoids including beta-carotene and zeaxanthin. 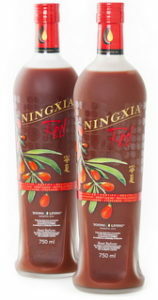 In fact, the Ningxia Wolfberry has the highest source of carotenoids in all known foods. Beta-carotene is best known as a nutrient for the retina. 5. Cancer Help. The main constituent of the Wolfberry is Lycium Barbarum Polysaccharide (LBP), and according to studies in China, LBP helps cancer patients rebuild their white blood cell count, enhancing phagocytes and the activity of natural killer cells, which bind to cancerous cells, as well as improving major classes of T-cells. “increase the antibody reaction to the T-cell antigen”. 6. More Cancer Help. Acetone extract from the Ningxia Wolfberry inhibits gene mutation. Some scientists say the fruit is a good supplement to prevent liver cancer. Also, studies show objective regression of cancer in patients with malignant melanoma, renal cell carcinoma, colorectal cancer, lung cancer, and others. Results also indicated LBP may be used as an adjuvant in the biotherapy of cancer. 7. Minerals & vitamins act as enzymes and co-factors in the digestion process. 8. Studies on seniors in China produced amazing results (many people live beyond 100 years of age in Wolfberry growing areas). Increases in Super Oxide Dismutase (SOD) and hemoglobin were found in serum in all participants. In other words Wolfberry “may help slow the ageing process”. 9. Protects against the free radical attack on the mitochondrial DNA – our energy furnaces inside each cell. Antioxidants fight against mitochondrial destabilation. 10. Helps lower blood sugar and in many tests at least stabilises blood sugar. 11. It is important that cell walls maintain their malle-ability for nutrients to cross this membrane. The free radical scavengers found in the Ningxia Wolfberry strengthen the cell wall and support efficient transport of flavonoid nutrients into the cell and waste products out of the cell. 12. Strengthens the brains neuro-transmitters against pervasive free radical activity, thus fighting against dementia and other forms of memory loss. 13. Promotes a sense of well-being, and has had noticeable results in tests, which reduces stress and anxiety. The tissues of the body (including the brain) are assisted in avoiding oxidative stress. 14. Has a B-vitamin complex essential to the body. In addition, these vitamins are vital for converting food to energy. 15. Cells need to communicate, especially those in the brain and nervous system. The synaptic responses are protected & fortified by the same polyphenols (flavonoids) that this berry uses to protect itself. 16. Provides powerful anti-fungal and anti-bacterial action because it contains solvetivone (an amino acid). Properties in the food fight viruses – it’s anti-viral. 17. Reduces pain caused by inflammation because the berry contains Beta-Sitosteral, a remarkable anti-inflammatory. 18. The Ningxia Wolfberry is high in protein (more than whole wheat), an essential cellular building block. 19. The Ningxia Wolfberry, unlike most berries, contains natural Vitamin E – a restorative antioxidant with too many health benefits to list here. 21.This berry, dubbed “A complete body health motivator” has many unique polysaccharides, not found in any other plant on the planet. What Makes Ningxia Red So Unique! ● Wolfberries, the miracle superfood, support multiple body systems and are an ultra-rich nutrient source. ● Blueberries contain ultra-high levels of antioxidants. ● Pomegranates support cardiovascular health and are also rich in antioxidants. ● Apricots are revered for supporting longevity. ● Raspberries contain ellagic acid, known to protect DNA. ● Therapeutic-grade lemon and orange essential oils contain the antioxidant d-limonene. Information Taken From: “21 Reasons To Drink Ningxia Red Juice”, by Health & Wealth, Inc. 2005. Sound Concepts.